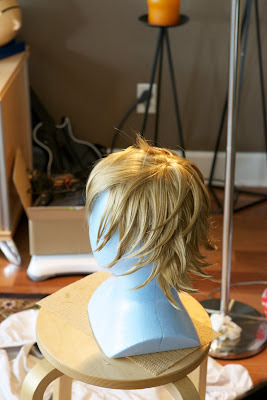 So I thought I might as well make a tutorial about how I spike my wigs [such as the one seen in my Roxas cosplay], and what materials I use. I honestly don't know much about wigs, or products to do so, other than what I have found out from my own experiences. With this in mind, experiment on your own as well. What I will provide here is merely advice on what I do and how it worked for me. 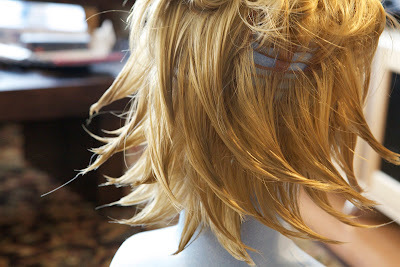 The first time I styled a Roxas wig was for Fanime 2009. It was my first time ordering a wig online and at the time I thought it went pretty well. However, once I got it in the mail [I had ordered it styled which I never recommend doing]. It was flat and bright yellow but I didn't have time to order a new one [or any money for that matter]. So I washed it with mild soap and let it start to air dry. At that time I also did not have a wig head to use which is something that I find essential to accurately styling and caring for a wig. 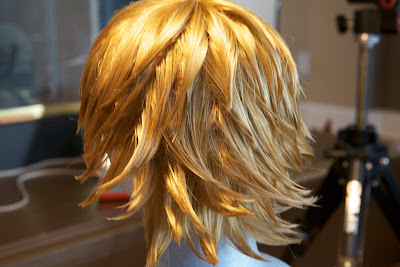 After Fanime I set out to find a new Roxas wig to style and work on and it wasn't until spring break 2010 that I had time to work on it. 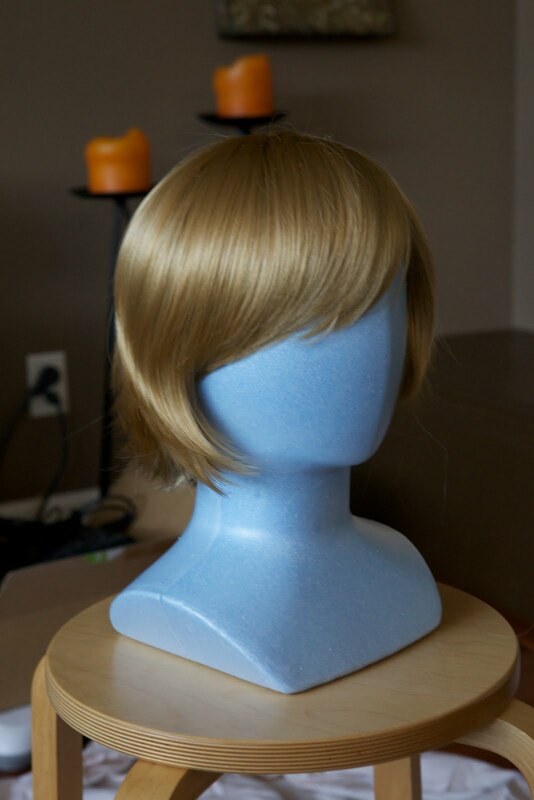 I ordered the actual wig on cosplaydna and after playing around with styling last year, I knew I could buy a plain wig and completely style it myself. So here we go! I like to start off by finding a nice place to set the wig stand on. I found a small stool from our kitchen and placed it on top of an old bed sheet so not to make a mess everyone. 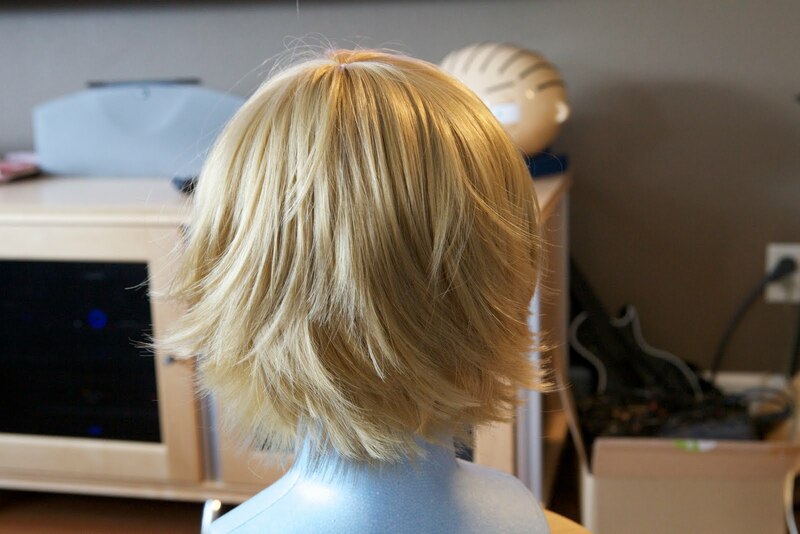 Then I pulled the wig onto the wig head and made sure to place a pin or two at the top and at the base of the neck in order to hold the wig in place while styling. Find a well lit area so you can see how it is going to look, and make sure to have many reference photos to double check. The wig I ordered was almost perfect to just get started at this point, but I needed to cut it down. If you need to trim your wig at all, here's my advice. I do not have any fancy cutting scissors so I just used the ones found around my house. When I made cuts, I did so with the hair, not against it, because this allows the hair to come to more of a gradual transition as opposed to a straight across cut. This is very important to make it look as natural as possible. For Roxas in particular, I did a lot of layering in the back so I could have different layers of spikes, and then cut a bit in the front but not too much. We want length in the front to build up the bigger spikes on top. As you cut, be aware of the shape of the character's head and don't cut too much off! Take your time and check your references often! Then I use my Got-2-be sculpting putty. It really isn't a putty material, more of a gel. I get a good glob of it and run it through my hands evenly, and then apply it on the wig. I start at the roots and pull out, giving volume and texture to the wig. Do not apply too much of this! It will make the hair greasy and sticky which you do not want. It's really just good for the volume at this point. Now we are ready to start styling! Get your hairspray and styling glue ready. We will mostly be using the hairspray so don't go glue happy. I used some hair clips and pinned the upper layers up and out of the way. As you will notice, wigs are built in layers and different rows of hair make up the body of the wig. So, when you are getting a spike ready, make sure you are grabbing hair from rows that are near each other. Otherwise, it will make the spike stringy. Then, start forming/combing spikes with your hands without any materials yet. Start to get an idea of where you want to go, and once ready, get the hairspray ready. Then, hold your hand under the piece and spray a bit on the part of the spike near the roots, lightly, and then apply more generously toward the tip. With your fingers, pull the spike into a tip and lightly twist in the direction you want the spike to go [even if you want it to come out towards you]. Hold the tip for a few minutes, making sure it is mostly dry. Let go of the piece and make sure it goes where you want. Once you are satisfied, let it dry completely before applying a second coat of hairspray. Continue this step with every spike around the general part of the head. Once you get to the top, things get different. As you are making the spikes, be aware of the general shape of the wig. For Roxas, he has a lot of spikes coming out in the back, and then they lay close towards the front of his face. And at the top, he has several spikes that curl straight up towards the air. You can use these general spiking ideas for other characters, but keep in mind how you want the overall look to be. Once you get to the top, and towards the face, make sure you make the tips of the spikes very clean so that they do not poke your eye or irritate your face. For Roxas at the very top, I had a hard time getting the spikes to go straight up in the air. So I highly hairsprayed and a bit of gel most of the pieces and then pinned them back to let them dry in that form. Once you take the pin out [about an hour or so later], it will definitely look weird. At least it will have form! Then pull it down with some hairspray and gel and make it blend in better with the rest of the wig. Once you've finished spiking everything, apply a general coat of hairspray to hold it all in place. The hair should feel pretty sturdy and almost crunchy [I know it looks a bit unnatural, but that's what happens with these crazy spiky styles!]. Continue to come back and apply a few more coats of hairspray every hour or so until you are satisfied it will hold. You should be able to wear the wig many times without ruining the general look. I am sure that every once and a while you will have to do touch ups with a bit of hairspray [and maybe some gel/glue] but for this style, it should be pretty set. Good luck everyone! If you have any questions feel free to ask! I will do my best to help. I am working on editing the video of this whole process so stay tuned soon! Continue to check our Youtube Channel for more updates, tutorials, and pictures! Do you have a picture with all the spikes that poke straight up?